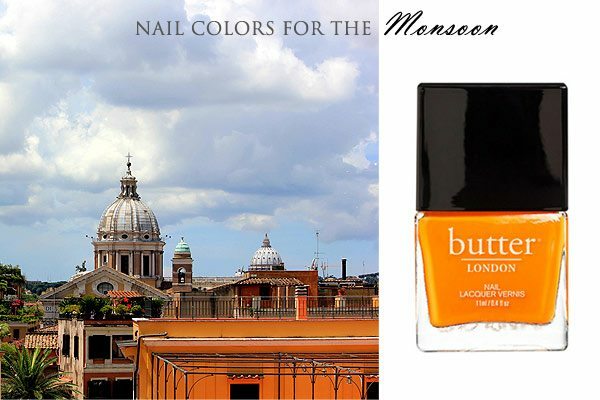 Best Nail Polish Colors for Monsoon 2015 for Your City! 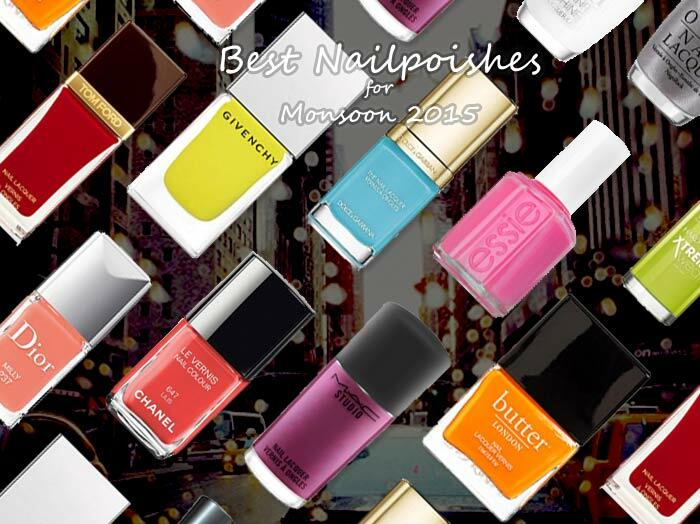 Best Nail Polish Colors for Monsoon 2015 According to Your City! 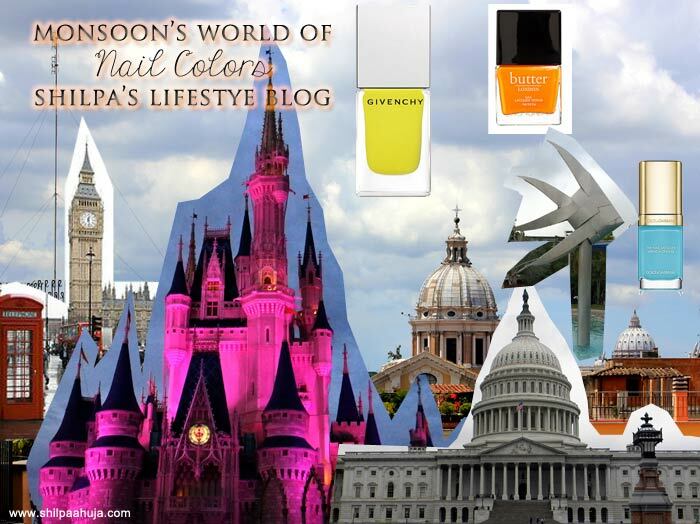 Pick Your Nail Polish Colors for Monsoon According to your City! The early rain showers have already started, and soon enough, the monsoons will be here! 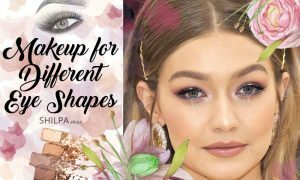 The sky will go from sunny bright blue to dramatically beautiful grey – with thick clouds interspersed with sun rays streaming through their gaps, creating wonderful hues of yellows and oranges and pinks! And you know what that will call for? 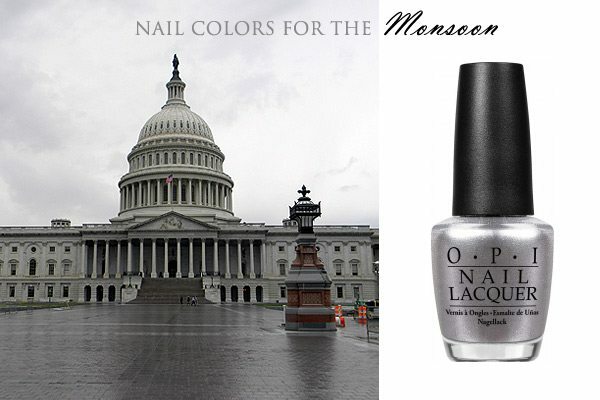 Colorful rain boots, umbrellas, and of course, nailpolish that will brighten up your day! 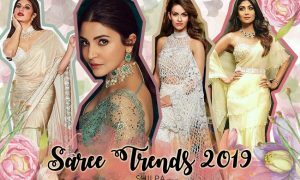 Let’s take a look at what nail polish colors for monsoon we will be wanting to wear this year to perfectly contrast the bleak grey skies! 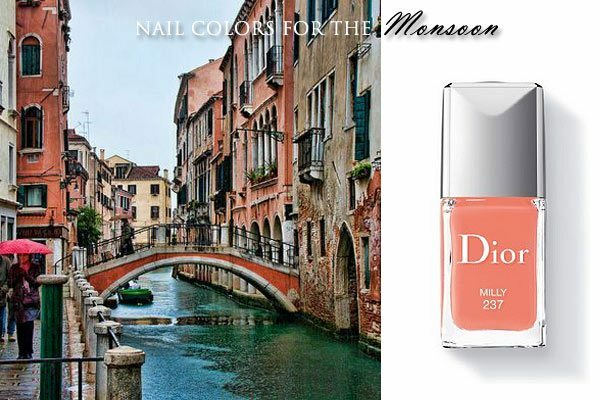 To make it more interesting, the colors I’m choosing are inspired by rainy days all over the world! It may not be raining all over the world right now, but I can compile what it looks like when it rains, together in one place! Beautiful Rainy Day Pictures from all over the World! Which is your color according to your city? Or better yet, choose one according to the city you want to visit!! I’ve visited New York in all weathers – the sunny, rainy and snowy. Also the slushy – that’s the worst – rain+snow in puddles of slush!! But just the rain is way prettier – when you can move around without feeling frosted! 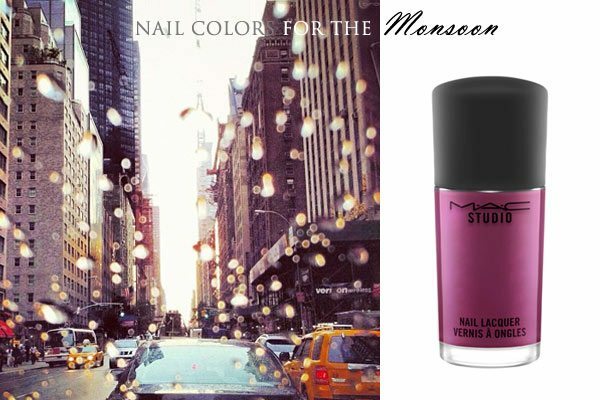 Rain needs bright fashion colors, such as this purple, to make your day more fun, when the people are rushing about, trying to catch cabs and to get to their offices! The rainforests of Amazonian Brazil have all shades of greens – from olives to leaves to dark grassy greens. I’ve never been there, but I’m sure it would look something like the Australian tropical rainforests. 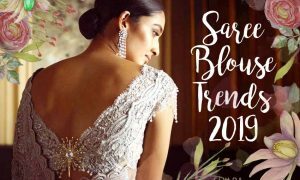 And this season, let’s put on some of this bright leaf green while we dream about going there! 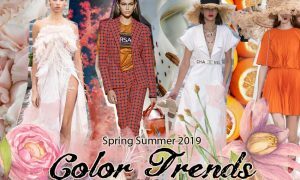 Let’s reserve the overly bright Chinese-red for the fall. 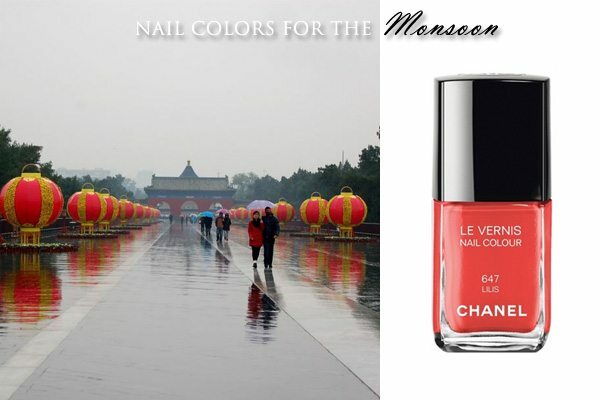 For the monsoon, coral red is brightly beautiful, just like the lanterns! Cairns, Australia has tropical weather, so it’s raining there all year round! Of course, they have a rainy season too, when it rains even more. Think of Cairns, and I am reminded of the bright blue colors of the coral reefs and the famous public pool! 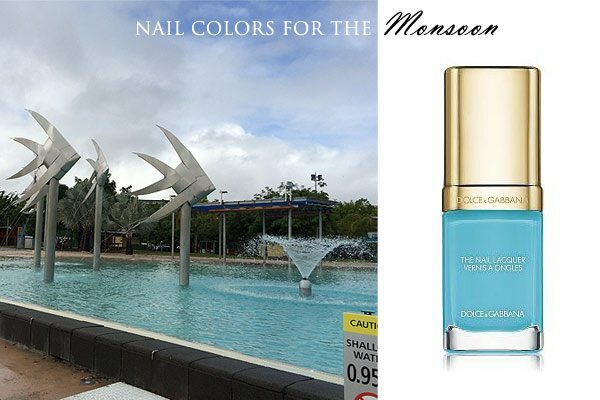 And this pool-blue-ish color by D&G is a perfect shade for this season! My Signature is “DC” – O.P.I. The only time I ever had a chance to visit this city, it rained nonstop!! To the point that I was slipping on the side walk and being splashed on by the cars! Phew, what memories. But the city stood bright and shiny. 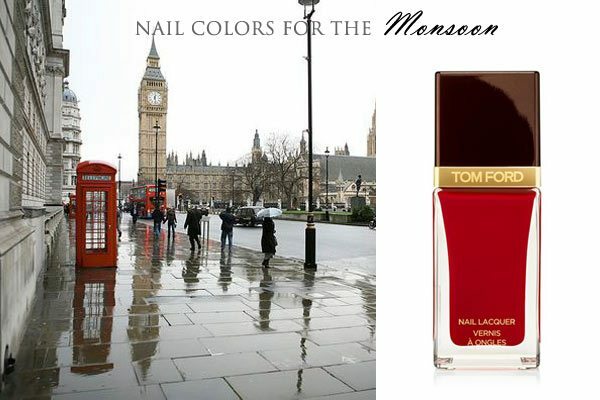 There’s plenty red in London – with the telephone booths and buses. That’s why I’m gonna call this red the ‘Phone-Booth Red’ and dedicate it to that lovely historic city!! 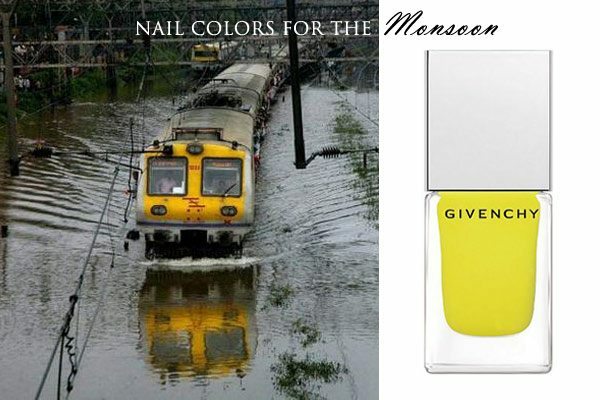 Mumbai Monsoons – the infamous times everyone dreads yet enjoys! The monsoon season in Bombay is so many things all at once – the filthiest water you can imagine flooding every place in the city, kids playing with paper boats, plastic sheets covering slum dwellings and corporate towers alike, and everyone enjoying a hot cup of tea with warm fritters! 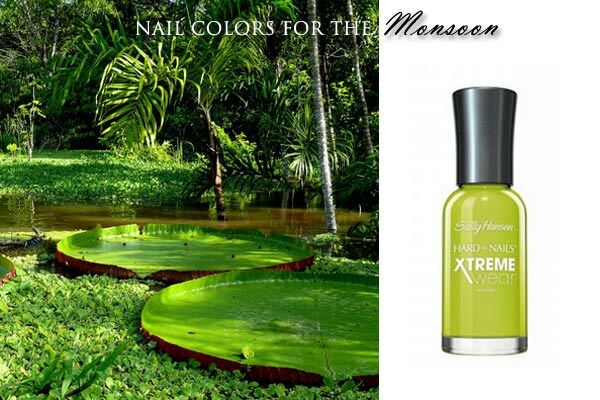 And with that kind of lively spirit, what better color to choose for the monsoon than the brightest yellow? And forget sunflowers, this one is right from the Mumbai taxis – the Cab Yellow!! 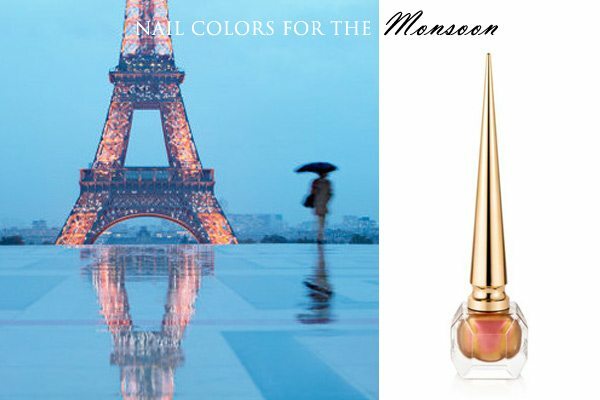 Paris would shine with glamour, beauty and attitude even if the other cities cease to shine! That’s why I wanted to choose an iridescent color to represent it. And this one seems to portray the night lights of the Eiffel Tower so perfectly- with its shiny yellows and peaches, it’s like someone took all the night lights and combined it in this tiny bottle! Rome is the most sculpted city I have ever laid my eyes on. Right from its floors to ceilings to column capitals to domes, everything is sculpted and painted and just gorgeous there! Including the food and flowers – the sculptures are adorned not just with angels, but also fowers, leaves and grapes and what not! Even the real flowers and food seem so beautifully designed! And where they don’t sculpt, they plant terra-cotta – on the roofs! I took this picture from the Capitoline Hill, over-looking the Vatican City, right after it rained. And check out the gorgeous terra-cotta roofs and mango-peachy paints on the building facades! Before I wrote this article, I didn’t realize how many cities I have visited during the rains. Maybe the rains love to follow me to every trip of mine! I took this picture from the top of Willis Tower, overlooking downtown, while it rained. Some cities like Mumbai completely transform during the rains. Chicago, on the other hand, doesn’t like to transform unless it’s heavily snowed in. 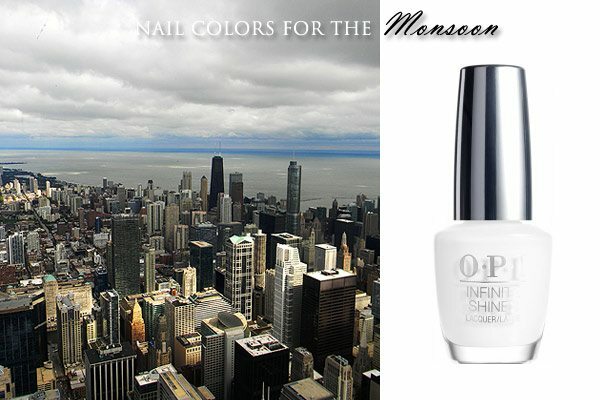 The city maintains its handsomeness with the towering buildings, the greys and the blacks. It just adds clouds on top of them all. That’s why I chose the coudy white to represent it! Venice is another city that it was raining in the day I reached there. But it made it look that much more beautiful! Plus, the joy of finding a tiny restaurant by being lost in the narrow streets, sitting in a semi-outdoor place, and eating warm pasta while looking at the amazingly beautiful canals is something from the outer world! The city’s buildings all have peeling paint facades in corals, mangos, reds, brick and off-whites. 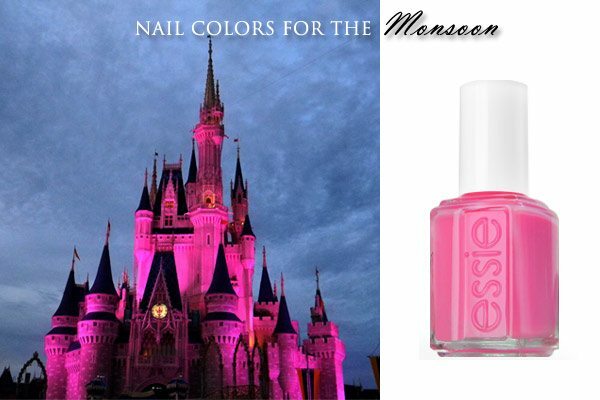 And this monsoon season, I would certainly pick this pink-peach shade to wear! 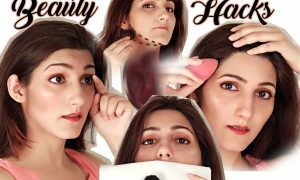 51 Beauty Hacks (with Pictures) to Take Your Game to Pro Levels! 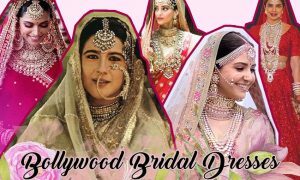 15 Best Girly TV Series You Need to be Watching Now! 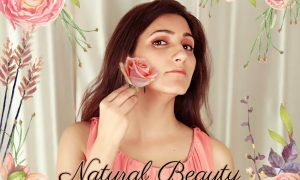 ShilpaAhuja.com may earn affiliate commissions from sale of some of the products listed on this website. 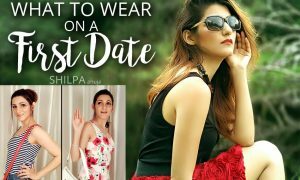 Copyright © 2014-19 Shilpa Ahuja Media. 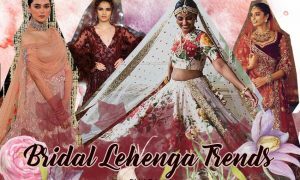 All Rights Reserved | Reporting the future of fashion.